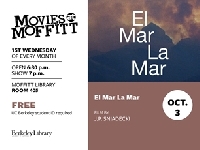 Movies @ Moffitt is the student-to-student monthly documentary spotlight and viewing. M@M is free. An immersive and enthralling journey through the Sonoran Desert on the U.S.-Mexico border, EL MAR LA MAR weaves together harrowing oral histories from the area with hand-processed 16mm images of flora, fauna and items left behind by travelers. Subjects speak of intense, mythic experiences in the desert: A man tells of a fifteen-foot-tall monster said to haunt the region, while a border patrolman spins a similarly bizarre tale of man versus beast. A sonically rich soundtrack adds to the eerie atmosphere as the call of birds and other nocturnal noises invisibly populate the austere landscape.